When I went to enter into my library data base this latest book that I had just finished reading, I did a search to see if I had previously entered the book. Not only did I find an entry for it, but to my amazing revelation, I discovered that I had already read and reviewed the book four years previously. I went to my review shelf and there it was in place with a copy of the review neatly folded in the rear overleaf. I had purchased another copy of the book, put it in my to-be-read shelf, and read it. What to do now? A review already existed here, why write another? Expand the original? After some consideration,	I decided to write this new review as if the original review didn't exist. 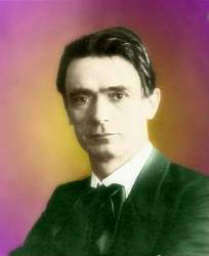 [page 7] The day will come, Rudolf Steiner once declared, when the whole human race will acclaim the Bible as the greatest book in the world, inasmuch as it will be seen to contain the whole history of the spiritual evolution of mankind. St. John: "I am the light of the world." [page 13] The significance of the Love that streamed into the world from Golgotha lies precisely in the fact that it was united, in a single Being, with the Light of the World, with true Wisdom. [page 14, 15] A pictorial presentation of the mood and feeling arising from a right approach to the Gospel of St. Luke is to be found in the portrayals of the Mithras bull being driven to the sacrifice, bearing on its back the figure of a man. . . . Contemplation of the sacrificial animal carrying the man, for whose sake it must be sacrificed in order that, as man, he may be able to advance along his path of life, provides the right basis of feeling for study of the Gospel of St. Luke. [page 17] The Strength infused into our earth through Chris-Jesus, the Strength which orders and directs all things and which when it is unfolded, signifies supreme Power — that is what is described in the Gospel of St. Mark as a third attribute of Christ-Jesus. If we inspect the first twenty pages of this book carefully we discover that the first three Gospels represent the attributes of thinking, feeling, and willing. What is the fourth attribute that completes the quaternary? 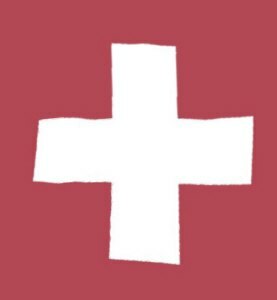 A hint comes from the fact that the first three are represented by three animals: eagle, bull, and lion. In the 1960's television serial Star Trek the qualities of thinking, feeling, and willing were epitomized dramatically in the three characters Spock, Bones, and Scotty. Mr. Spock was the quintessential thinker, Dr. McCoy or Bones was the feeling person, and Scotty was the engineer in charge of making the Enterprise starship respond to the will of the Captain. The Captain, of course, was James Tiberius Kirk, and Capt. Kirk was in charge of the entire ship and its crew. Capt. Kirk, when confronted with a problem, received thinking advice (data) from Spock, feeling advice from Bones, and willing advice from Scotty ("The ship is barely holding on, Captain!"). After all the advice was given, it was up to Kirk to make the decision, and often the decision came right out of the blue — had nothing to do with any of the received advice. Carl Jung called this fourth attribute, intuition, to signify its origin — as if it came from another world. [page 19, 20] . . . if we have acquired from the Gospels of St. John, St. Luke and St. Mark some conception of the Thinking, Feeling and Willing of Christ-Jesus, we can attempt to harmonise these three attributes into a united whole. The picture will inevitably lose precision and vividness, for no human faculty is capable of unifying what it has made separate and distinct. In Being itself there is unity, not separation; but for us, only at the final stage is it possible to gather the separated attributes into a unity. Although it will be less vivid, we shall at last have a presentation of what Christ-Jesus was as earthly Man. [page 21] . . . a picture of the human personality of Christ-Jesus can be afforded only by study of the Gospel of St. Matthew. Steiner points out that the three sets of fourteen generations given in St. Matthew's Gospel correspond to the first three ages of man in the following way. The first fourteen generations take us from Abraham to the first part of the Book of Kings and parallel for the Hebrews the development of the physical body of the human being which occurs during the first seven years of life. The reason for the fourteen generations in place of seven is the need for a period of quiescence or pralaya between each generation during which what is achieved is solidified before the next generation. This process called pralaya occurs during the evolution of the cosmos, such as when the Sun re-absorbs the Old Moon, returning to the Old Sun phase before the final separation stage into Sun and Old Moon occurs. Although Steiner doesn't mention it specifically, one can infer that the second phase of development of the Hebrew people, the second fourteen generations bridging the time span from first Kings to the Babylonian captivity, corresponds to the emergence and maturation of the etheric body of the Hebrew people, just as today, the etheric body of a human child emerges during the years from seven to fourteen. And finally the third phase during which the development into adulthood occurs corresponds to the third fourteen generations of the Hebrew people that span from the Babylonian captivity to the birth of Jesus in Bethlehem. [page 31] A brain capable of understanding Jahve had to be preserved through physical heredity. Jahve's covenant with Abraham had also to pass on to his descendants. This, however, called for the uttermost devotion to Jahve on the part of Abraham; for it is possible to develop a particular organism to further stages only if it is used in conformity with the purpose for which it was originally created. Only by the purification and refinement of the human body over these 42 generations could Zarathustra find a human body that provide the instrument for his incarnation as described in the Gospel of St. Matthew into the body of Jesus in Bethlehem. This great Spirit first incarnated in Zarathustra's physical body, then incarnated in Moses' etheric body, and later incarnated in Hermes' astral body. [See ARJ Gospel of St. Luke Review.] We move ahead to Bethlehem and find another Joseph who has a dream that tells him to take Jesus newly incarnated with the Ego of Zarathustra with him and Mary to Egypt. [page 42, 43] Thus, in the appearance of the Bethlehem Jesus — only later called the Nazarene — there is a recapitulation of the whole destiny of the ancient Hebrew people up to the return from Egypt to Palestine, the Promised Land. Events in the outer history of the Hebrew people, extending over long, long centuries, are now recapitulated in the destiny of that human being who was Zarathustra incarnated in the body of the Bethlehem Jesus. 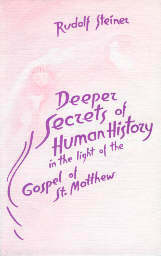 This — conceived on the vast scale of in which it is presented in the Gospel of St. Matthew — is the secret of human history in general. Human history cannot be understood unless it is recognised that in the destiny of every great Individuality charged with a special mission the whole process of development through centuries is recapitulated; that such Individualities represent the essence and extract of what has been achieved in history through long ages. And what had been achieved in history through long ages leading up to the time of Christ-Jesus was the preparation for the emergence of humanity into a love that was free from the bonds of one's bloodline. Until that happened humankind remained with one foot in the animal kingdom where bloodline is all important. The stage had been set for the emergence of the Ego, the 'I' of humankind in freedom and love. [page 46] In the 'I' the kingdom of the Spirit speaks; the Spirit from the heavens speaks when the 'I' has become fully self-conscious. This helps us to understand that when Christ-Jesus said, "The kingdom of heaven is at hand," that He was referring to the imminent emergence of the 'I' of humankind. In other words, the mineral kingdom, the plant kingdom, and the animal kingdom were soon to be supplemented by the "kingdom of heaven" which Steiner calls an alternative to the phrase, the "kingdom of man." [page 54] Through the widespread intermingling of blood, conditions which in earlier times had great meaning and purpose, passed away, but in their place came the possibility of the full activity of the human Ego. Thus the true kingdom of mankind — the Kingdom of Heaven - was added to the other kingdoms. [page 67] Those, therefore, who are followers merely of the Law as given on Sinai - that is, the Pharisees and Sadducees — are exposed to the danger of their development coming to a standstill. they are those who at the Baptism of John will see, not the Lamb, but the Serpent. "Repent ye!" John shouted to those who came to him to be baptized. We would understand his meaning better, Steiner tells us on page 69, if we understood him to be saying, "Change the tenor of your minds!" Do not look back to the old traditions, but forward to the new. John was preparing his followers for Christ-Jesus who was to come forth as the Lamb of God and to being preaching to all the message [Matt. IV, 17], "Repent, the kingdom of heaven is at hand." If I may hazard an interpretation of these words, "Change the tenor of your minds as the Spirit of heaven that formed your being from without in ancient times is residing within you from now on."